Anastrepha nigrifascia Stone is one of six species of fruit flies of the genus Anastrepha which occur in Florida or which have been established in Florida at some time. This species is limited to the Florida Keys, from Key Largo Key to Key West. The holotype female was trapped 21 May 1935 by G.B. Merrill on Big Pine Key. This species appears to have a very restricted distribution. It is seldom collected and is not considered to be of economic importance. Trap collection records indicate that it probably occurs in the adult stage throughout the year, although the heaviest populations appear to be during April–May. 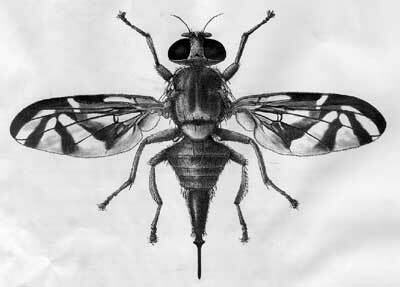 This is a small yellowish fruit fly, somewhat larger than a house fly, with rather long, patterned wings. A. nigrifascia can be distinguished from other species of Anastrepha which have been recorded for Florida by the presence of a narrow, transverse, dark brown band across the posterior of the mesoscutum at the base of the scutellum and by the ovipositor of the female, the tip of which is tapered and unserrated. The head is yellow with frontal bristles and ocellar triangle black; antenna yellow, arista yellowish basally becoming brownish distally. The mesonotum is mostly brownish-yellow, the scutellum yellow, while the macrochaetae is black; pile yellow brown. The legs are yellow. The wing pattern is partly yellowish, partly brownish infuscated, and is somewhat variable. In some specimens, the inverted V band is connected at its apex with the S band on the anterior portion of the wing, while in others the inverted V band is incomplete with the distal arm of the V connected anteriorly to the S band and the proximal arm of the V constricted or separated in cell R5. Figure 1. Adult female. Drawing by Division of Plant Industry. Figure 2. Ovipositor tip. Drawing by Division of Plant Industry. The life history of Anastrepha nigrifascia has not been ascertained, although adults have been reared several times from its two known hosts. State Plant Board of Florida Eleventh Biennial Report for the period July 1, 1934-June 30, 1936. Jan. 1937. p. 21. Anastrepha sp. "W," Brown. Stone A. 1942. The Fruit Flies of the Genus Anastrepha. U.S. Department of Agriculture Miscellaneous Publication No. 439, Washington, DC. 112 pp. Author: H.V. Weems, Jr. (retired), Florida Department of Agriculture and Consumer Services, Division of Plant Industry. Originally published as DPI Entomology Circular 66. Updated for this publication. Publication Date: January 2002. Latest revision: January 2012.